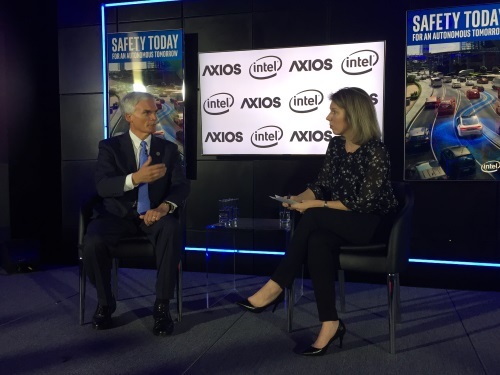 News website Axios and semiconductor maker Intel sponsored a one-hour listening session on Sept. 13 regarding connected and autonomous vehicle or CAV trends from Rep. Robert “Bob” Latta, R-Ohio, chairman of the House of Representatives Subcommittee on Digital Commerce and Consumer Protection; David Schutt, CEO of SAE International; and John Bozzella, president and CEO of the Global Automakers trade group. Latta (seen above at right) noted that his focus right now is on getting Senate support for the SELF DRIVE Act, which the House’s Energy and Commerce Committee passed unanimously in September last year. “My fear is that if we don’t get legislation passed, we will fall behind the rest of the world in autonomous vehicle development and that the states would have to go do their own thing” in terms of regulating CAVs. But in the long run more “uniform” standards will need to be worked out especially in terms of governing how CAVs interact with each other, vehicles that are still human-controlled, and roadway infrastructure. Global Automakers’ Bozzella added that “what we are seeing” with CAV development right now “is a convergence of business models and investment around mobility” that aims to improve highway safety while boosting vehicle efficiency, especially in terms of reducing fuel consumption. Latta emphasized that same point, saying that “safety must be first, last, and always” regarding the public deployment of CAVs, while noting that cybersecurity needs to be built into them with “redundancy on top of redundancy while protecting privacy” as well.